Our Sahara Oasis Swimming Pool Paint is a solvent-thinned chlorinated vinyl tolune-acrylate, low-luster coating for use on unpainted or previously painted concrete swimming pools. This pool paint will smooth and fill the rough surfaces of concrete and reduces the chances of abrasion or scratches to the swimmers. This product will protect those concrete surfaces that can slowly deteriorate from exposure to weather and water. Application may be by brush, roller or sprayer. 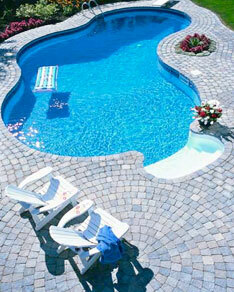 This pool paint is available in 3 colors: Surf Blue, White and Lane Marking Black. Got Questions? Give us a call at 1-800-821-2029! 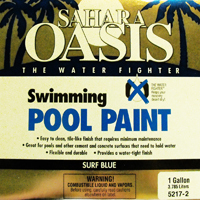 Sahara Oasis Swimming Pool Paint - Surf Blue Available in 1 gallon and 5 gallon containers. See below for color swatch. Sahara Oasis Swimming Pool Paint - White Available in 1 gallon and 5 gallon containers. See below for color swatch. Sahara Oasis Swimming Pool Paint - Lane Marking Black Available in 1 gallon containers only. See below for color swatch.